Even despite all of the efforts put into regularly maintaining trucks to prevent them from eventually breaking down, some repairs are often entirely unavoidable. 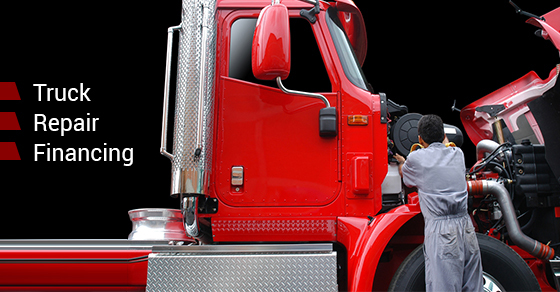 With the average truck repair costing more than $5,000 dollars, a broken-down truck can present serious challenges, especially for those who are unable to finance the repairs themselves. It becomes critical to get the truck on the road as quickly as possible, given that a truck that is off the road isn’t generating any profit. There are several options to consider when presented with an out-of-service truck, including taking out a line of credit via a traditional bank, which can present its own set of challenges, or tapping into a savings fund. However, there are also some alternative programs, such as commercial truck financing programs that are generally much more flexible than that of a typical bank, many of which specifically cater to those with poor credit scores as well. This is a great option for those with poor credit because the loan is based on equity. The loan is specifically based on the value of the truck (loan-to-value), which is usually between 25-50% of the value of the truck. Value can be determined by the truck’s low market value, trade value or liquidated (auction value). The transaction is often completed in a few days. Consider financing your repairs with our team at Truck Loan Center, where we offer easy approvals and low interest rates. While one challenge with this option may be the sheer difficulty of finding a bank that will loan you the necessary money to finance truck repairs, it is still sometimes possible, especially if your credit score is high. The criteria for being eligible for a loan depends primarily on your credit score and less so on the value of the truck itself. While the borrower can generally receive better terms and more money from a bank than from a commercial truck financing program (with the borrower even able to receive up to 100% of the value of the truck), the transaction process is not always as fast as the service offered via a truck financing program. A third option is to inquire about a loan from a truck repair shop. Ensure that you review and agree to the terms before signing. As is the case with any vehicle, trucks can wear out, break down and get damaged. If you can’t afford these repairs out of pocket, explore the above options for reliable alternatives.